William Rowett was born in Polperro, Cornwall in 1806. He was a Master Mariner by profession, keeping the title ‘Captain’ for the rest of his life. By 1834 he had abandoned seafaring, was engaged in the ship-broking business, and owned a rope-walk or cable factory in Liverpool, Lancashire. 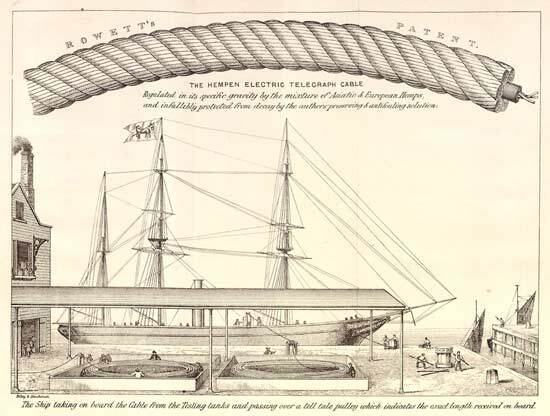 With the prospect of the Atlantic Telegraph becoming a reality he interested himself in submarine telegraph cables and patented a “light cable” formed with a hemp or rope outer covering, rather that iron-wire armour on April 10, 1858 (see below for full text of the patent). He obtained a great deal of publicity after the original Atlantic Telegraph failed, writing pamphlets and appearing before Parliament advocating his hemp cable. The Ship taking on board the Cable from the Testing tanks and passing over a tell tale pulley which indicates the exact length received on board. Between 1858 and 1865 Rowett lived in France, patenting his hemp cable there in 1858. His sales pitch obtained a concession of the Imperial government in May 1860 for a trans-Atlantic cable between Brest, the Azores and St Pierre & Miquelon islands of Canada. In July 1864 this was renewed and in 1865 he moved to London to raise capital for the Ocean Telegraph Company, intending to lay his own hemp-covered, india-rubber insulated cable from France to Canada and the United States. It did not proceed. Note 1: To a depth of 100 fms. passing over two Banks about 300 miles apart of less than 200 fms. Note 2: All of this distance the depth is about 100 fms. 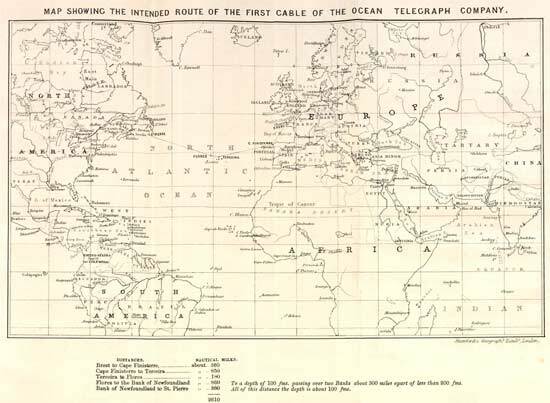 Telegraphic Communication with America – A company has recently been started, under the title of the International Ocean Telegraphic Company, which proposes to establish telegraph communication between Europe and America by a route which it is contended, presents fewer difficulties than those met with in the course taken by the Atlantic Telegraph Company. Mr W Rowett, one of the directors of the company, attended at the Underwriters’ Rooms at Liverpool recently, to explain the nature of the project. The proposed starting point of the line is Brest; thence it will be carried across the Bay of Biscay to Cape Finisterre; thence to the Azores, touching either at Terceira or Flores; and finally, skirting the southern edge of the great bank of Newfoundland, to St Pierre, one of the Miquelon group of islands belonging to the French. The whole length of the line will be about 2,300 miles, but the longest section – that between the Azores and Newfoundland – will not be more than 800 miles in extent. The distance across the Bay of Biscay is 360 miles, and from Cape Finisterre to Azores about 780 miles. The deepest point of the route is 3,700 fathoms, and is between the Azores and the Bank. Mr Rowett produced a specimen of the cable which it is proposed to lay down. 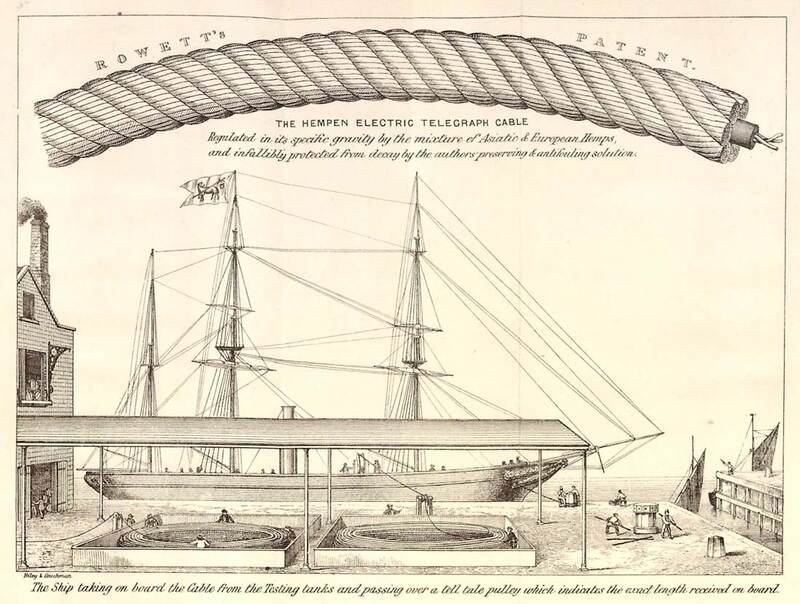 The telegraph wire is surrounded with a coating of india-rubber, and this is enclosed with a spiral coil of hemp – a mode which Mr Rowett maintained possessed great advantages over the outer covering of wire rope by which the Atlantic cable was surrounded. Mr Rowett explained that the great drawback hitherto in the use of india-rubber as an insulator had been that in the process of manufacture it became mixed with foreign ingredients which were speedily acted upon by the salt water, and the insulation destroyed. Recently, however, a mode had been discovered by which india-rubber was preserved quite pure, and this would resist the action of the water. It was proposed also to preserve the hempen covering from decay by steeping it in a mixture of which Mr Rowett was himself the inventor, and a testimonial to the efficacy of which he produced from Admiral Elliott. The weight of the cable proposed to be used was stated to about 3 cwt per mile, while that employed by the Atlantic Telegraph Company was between 15 cwt and 16 cwt. Mr Rowett expected that a superior cable could be constructed upon this plan for about £150 a mile, and the cost of the whole line he did not suppose would exceed £400,000. The company has obtained a treaty from the French government authorising them to construct the line; and the money is only wanting, the capital required being £500,000, which it is proposed to raise by the issue of 35,000 shares of £20 each. Rowett became involved with the promotion of the Scilly Islands Telegraph Company, connecting Cornwall with the islands, in London in May 1869. A 31-mile hemp and india-rubber cable to his specification was made by R S Newall, the rope and cable manufacturer, and laid in September, but it quickly failed and was replaced by an iron-wire armoured circuit that proved more durable. The Land & Sea Telegraph Construction Company was promoted as a speculation in the summer of 1869. On July 30, 1869 Rowett agreed to sell them the patent right to the hemp-covered cable and his “extensive” cable works at Plymouth Harbour, but the new concern came to nothing. William Rowett was to return to Cornwall and die in Polperro, his birth place, in 1875. Sources: Bibliotheca Cornubiensis, 1878; The Ocean Telegraph Cable by W Rowett, 1858 and 1865; The Times and The Western Mail newspapers; The Repertory of Patent Inventions Vol XXXIII, 1859, pp 48-53. Specification of the Patent granted to William Rowett, of Netherfield-road, Liverpool, in the County of Lancaster, for Improvements in the Construction of Electric Telegraph Cables or Ropes.—Dated April 10, 1858. My invention principally consists in a method of constructing, preserving from decay, and regulating the specific gravity of electric telegraph cables or ropes, so that they shall possess a semi-floating quality, which I propose to effect by constructing such said cables or ropes of Indian grass fibre, New Zealand hemp, Manilla hemp, European and American hemp and flax, also cotton-wool, coir fibre, cocoa-nut fibre, and other similar fibrous materials which have not heretofore been used or employed either entirely or principally in the construction of electric telegraph cables or ropes. I propose also to use, in combination with any or all of the above-mentioned fibrous materials, a solution composed of the following ingredients, matters, or substances, namely, turpentine, rosin, paint, clean or coal tar, naphtha, water, copperas, arsenic, aloes, bitumen, alum, bichloride of mercury, gambier, india-rubber, shellac, copper-soap, or other metallic soap and brimstone, mixed and incorporated together in the order and proportions hereinafter fully described, or any one or more of the said ingredients, either separately or in combination, according to the climate of the country, the depth of water, and description of ground in which the cable is to be laid. First, as regards the construction of cables or ropes, they may be manufactured from either of the above-mentioned materials by any of the most approved methods of manufacturing cables or ropes by machinery; and further, my improved rabies or ropes may be formed of three, four, or more strands, either shroud or hawser-laid, and “wormed” or plain; or they may be formed, either plaited square, round, or flat, with any desired number of strands, and the centre or core of such cable or rope being composed of an insulated wire or wires employed as the conducting medium for the electrical current. These wires may be composed either of copper, silver, gold, platinum, or other suitable metal. The aforesaid conducting wire or wires may be placed on the outside of the cable or rope instead of at the centre thereof; but as this would add considerably to the length of the wire or wires, and expose them to injury, I do not recommend its adoption. The cable or rope thus constructed I propose to steep in or pass through a solution composed as follows:—One barrel of raw turpentine, one barrel of coal tar, one pound of copperas, one pound of arsenic, two ounces of aloes, two ounces of alum, three pounds of bichloride of mercury, one gallon of naphtha, and three pounds of india-rubber. These ingredients are to be mixed and intimately incorporated together in a suitable vessel, and heat applied thereto. The specific gravity of the above solution may be increased by the addition thereto of white lead and linseed oil. Clean tar and rosin may also be used, instead of turpentine and coal tar, as before mentioned. Water may be used, whenever it is necessary, to dissolve any of the materials. In some cases, bitumen may be used instead of turpentine; shellac may be used instead of india-rubber, and gambier may be used instead of aloes, and copper-soap or other metallic soap may be used instead of turpentine and tar. In cases where the ground in which the aforesaid cable or rope is to be laid is very foul, either of the above solutions, when properly made and applied to the cable or rope, will effectually protect it from being injured by worms or animalculae of any kind in any situation either in the sea or on land, always taking care to vary the combinations of the ingredients of which the solution is composed, according as position, climate, and other local circumstances may require. I consider the foregoing solution to be generally applicable for preserving and giving specific gravity to cables or ropes made of either of the before-mentioned fibrous substances. The coating. or saturating of them with the above solution or solutions may be effected either before the fibrous materials (being spun into yarn) are formed into strands, or afterwards, or after the cable a rope is made, or both. The above method of regulating the specific gravity of the cable or rope, by adding more or less of the solution, admits of its passing with sufficient speed through the water for adapting itself to the undulating bottom or bed on which it is intended to rest. 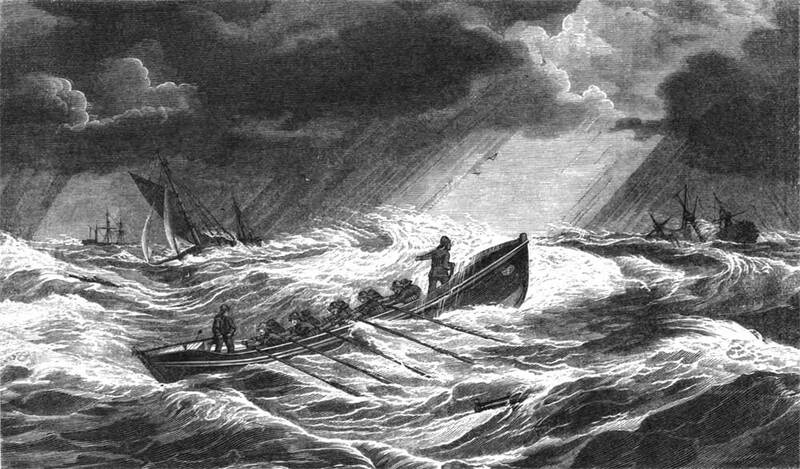 When it is required to underrun or lift the cable or rope to the surface of the water, the weight thereof being regulated as above mentioned, but little additional power would be required to effect such lifting of the said cable or rope beyond that which would be necessary to overcome the friction of the water, which will always be in proportion to the length of the cable or rope to be hauled through the water ; moreover, the said cable or rope will so tighten and contract upon its being immersed in the water, and exposed to the low temperature thereof, that whatever strain may be applied to the said cable or rope, comparatively little, if any, tension would be exerted upon the insulated conducting wire or wires, when disposed within the cable or rope as aforesaid, and it is an important feature that by thus constructing the cable or rope it may be allowed to run out from the ship employed to lay it down with but a nominal strain either upon the cable or the insulated conducting wire or wires therein, thereby avoiding the risk of damaging either of them; and further, by the above means, the cable or rope may be laid in any water irrespective of its depth, and during any weather, however boisterous, in which a ship could make her course. Another mode of constructing electric telegraph cables or ropes according to my improved method is as follows:— Suppose it is desired to make a cable three inches and three-quarters in circumference, proceed as follows:—Take 120 yarns of well-dressed Riga, or St. Petersburgh, or Italian, or best American hemp, and prepare them by steeping or saturating with either of the solutions before described; form these yarns into a rope of four strands wormed with suitable line of the same material, which may be effected by any of the known means of patent rope making; observing that in forming the aforesaid strands into a cable, the heart or centre thereof should be composed of three wires or conductors, arranged, disposed, unfixed, perfectly distinct and separate from each other, in one general insulating medium of gutta percha or other suitable insulating substance; these five parts of the cable, and the worming thereof, namely, the four strands and heart, and the worming being carefully laid together in the ordinary way of patent rope making, will produce a most desirable cable or rope suitable for electric telegraphic purposes, possessing three working medii for transmitting messages through water. It will be obvious that the cable or rope may be varied in size, so as to contain either a greater or less number of conducting wires, or to suit any special or particular purpose; and further the cable may be made of six or more strands, as may be desired. A similar description of cable or rope would be produced by employing Manilla hemp in the manufacture thereof, instead of the Riga or St. Petersburg! ], or Italian, or American hemp, before mentioned. The specific gravity of Manilla hemp being somewhat less than that of water, and, by the proper application of one or other of the solutions thereto, such a cable or rope could easily be made to possess the necessary specific gravity for sinking in water at any desired rate for speed. And further, cables or ropes intended for electric telegraph purposes, when manufactured of any of the other before-mentioned fibrous materials, can also in the same manner be made to possess the same properties as the foregoing cable. A cable of three inches and three-quarters in circumference, made of well-selected and well-dressed hemp or Manilla, would bear a strain of about five tons, but to submerge such cable no strain whatever would require to be exerted thereon. The speed of the ship employed to lay the above cable, and the speed at which such cable may be made to sink, can always be so arranged and regulated by the means before described as to make it lie fairly upon the undulating surface upon which the cable is intended to rest. I would here observe that cables manufactured of either of the before-mentioned fibrous materials may have an insulated conducting wire placed in each strand; but this would require such an increased length of wire, also add to the expense of the cable, and present electrical difficulties and risk of injury, that I do not consider this mode of construction at all desirable. The cable, instead of being manufactured, as above described, may be woven like a sword mat, directly over and around the insulated wire or wires, and thus avoid the helical form of the outside strands of the cable, when made according to the ordinary method of patent rope making. And further, cables or ropes manufactured of the materials before-mentioned, or either of them, may have the proper specific gravity imparted thereto for submerging them by the application of a wire or wires to either or to each of the strands thereof during its manufacture or afterwards, and this either with or without the solutions before described. And I desire it to be distinctly understood that I do not employ the aforesaid wire or wires for giving strength to the cable, as I do not consider this necessary; but I employ the said wires solely for the purpose of submerging the cable at the necessary or desired speed, as above stated, when the cable or rope is extremely light, as it would be when made of coir or cotton. This last described cable will be found specially adapted for extremely deep water, but for shallow or tidal waters, or in situations where the water is likely to be much agitated, I then recommend the application of a stout iron wire “rounding” to the cable to bear any chafe, nevertheless taking care to apply sufficient weight to the cable to maintain it in an undisturbed position on the bottom on which it is to rest; for if it is so light as to be moved by the tide no cable will last long; or, instead of the aforesaid wire “rounding,” a substantial wire cable may be spliced thereon. The above improved method of constructing electric telegraph cables or ropes applies also to ropes used on land for telegraphic purposes, and will be found more durable and less costly than the electric telegraph ropes, as heretofore manufactured, and by covering the gutta percha or other insulator or wires with yarns, rope, or cloth, made of any kind of fibre saturated and prepared with the solutions before described, their mixture or combination being regulated according to the character of the ground or situation in which it is placed, as aforesaid, the character of the rope will be still further improved. Having now fully described and set forth the nature and object of my said invention of “Improvements in the Construction of Electric Telegraph Cables or Ropes,” together with the best means I am acquainted with for carrying the same into practical effect, I would remark, in conclusion, that I hereby declare my invention to consist in, and I claim, constructing electric telegraph cables or ropes substantially in the manner set forth and described; and especially I claim the solutions above mentioned, whereby I am enabled to impart to such said cables or ropes the property of sinking at any desired speed to any required or unknown depth in water; also the use of the aforesaid solutions for preserving such said cables or ropes from decay when exposed to any and all kinds of corruptive or corroding influences both at sea and on shore, as above stated. And I desire it to be distinctly understood, that I do not intend to limit myself to the precise proportions of the ingredients employed in the composition of the before mentioned solutions, as they will require to be varied to suit local circumstances; but I have found solutions composed as above to answer well.—In witness, &c.